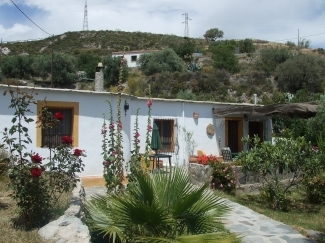 Casa Lujar, Orgiva, Las Alpujarras. Cortijo & shaded front terrace. A delightful traditional property, nestled just above Orgiva town, within walking distance of the restaurants and tavernas, yet harnessing the tranquillity and privacy that a good holiday deserves. 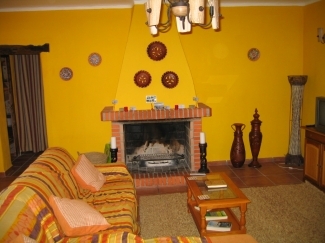 Situated in its own grounds with Olive trees and beautiful sun terraces, complete with a barbeque and a lovely pool. The area is one of outstanding natural beauty and the views are exhilarating. The house has a lovely sweeping lit drive way through the olive trees, passing the pool house to the parking area, where you will find the Cortijo. The entrance to the sun terrace is picturesque and shaded via a sun break, which sooths sun light during those hot summer months. The lounge is equipped with comfy sofa that can expand into a large double bed for the unplanned guest to stay over and for the winter evenings there is an open fire to relax the evening away. The room has a TV, DVD cinema system than can cater for MP3 disks, so please dont forget to bring along your favourite music and films for your own entertainment. Accompanied with the system is an Ipod docking station for the music lovers out there and recently installed Satellite Freeview Television catering for everyone. 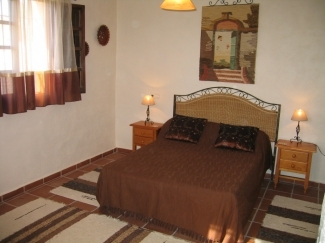 The Cortijo has two large bedrooms, one double and one twin which incorporates a double pull out bed. The master bedroom has built in wardrobe with his and hers storage spaces, complete with a lit alcove in the middle and lockable safe. All linen will be provided except for beach towels and towels for the pool. The pool terrace has fantastic views of Sierra Lujar and has a variety of sun lounge's to relax on, for the guest who doesn't enjoy too much heat then they can relax under the canopy of the swing or the Gazebo where they can absorb the family's activities in the pool. Please ensure that all children remain supervised at all times. Smoking - we prefer guests not to smoke in the house, simply for the benefit of future guests who may be allergic. Discount can be given for extended stays, please email us your details and requirements, then we can respond. Balance to be paid - 2 weeks prior to arrival.